Funny to reconsider that last post of mine, Trust the earth to hold you, in light of what happened the day after I posted it. I wondered about myself when I wrote those lines: “if I should fall, should I ever fall, if I ever dared to fall,” thinking as I was about all the abstract ways one can fall. Picturing perhaps some ill-begotten fall from grace, or a slow slide into the clutches of a sorrow I could not tame. No, it’s fair to say I was not thinking about a literal fall. I was not yet able to imagine what it might feel like to lose my balance, spin in a dizzying whirl, hit the floor with a sickening thud. Having no idea I would find myself at the Wooddale Fun Zone the very next night with my family on a spur of the moment outing. Let alone out on the rink. What possessed me to pull on those rollerblades that night? I had passed up every previous opportunity to skate, begging off the experience, using my quirky back as an excuse. I felt some mistaken confidence last Saturday night, having, as I did, a follow-up chiropractic appointment already scheduled for Monday morning to dispense with a minor complaint. Whatever damage I might do on skates that night could surely be fixed on Monday. Or so I thought. 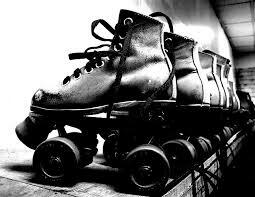 The first few times around the rink were stilted, my calves aching as I lurched across the floor, trying to figure out how to loosen up my legs so I could move with ease with wheels under my feet. I watched my family fan out across the rink, each of them faster and more graceful than me. I watched C’s friend’s easy stride and tried to follow her example. It was working, I was learning, moving more quickly after a few times around, zipping along. Feeling freer. Thinking I should have been doing this for years, how foolish I was to have passed on previous occasions. What I did not bother to consider was that I had no real idea how to stop. Gliding on wheels was a new sensation, bringing with it a flood of memories of things I hadn’t thought about in a long time. The one I dwelled on for a few loops around the rink had to do with my all-time favorite job, one I held for just a semester a lifetime ago. The time when I was a projectionist. I was the teaching assistant for a film history class, and it was my job to mount the film reels on the twin projectors, line up the celluloid and keep an eye on each reel as it dwindled. I’d prepare the next one to launch at just the right moment, starting it when the first black dot appeared in the corner of the screen, switching off the light on the first projector while revealing the other one at the instant the second dot appeared. I always got a little thrill in that moment, knowing the secret of how a movie is projected and being the one responsible for making it happen. It was a remarkably satisfying job. I recalled, as I rollerbladed my way around the rink, one jittery day when there was a particularly long film, six or seven reels in all, and I had made the mistake of taking the third reel out of its grey metal canister before I had a free projector to mount it to. I remember the loose film unreeling on the dirty floor as the first reel played, and the panic that gripped me when I stepped on it in my haste to wind it back into place. Suddenly I had shards of celluloid to piece together, and time was running short. I knew what to do; I pulled out the splicer and lined up the pieces, taping the frames back together, triple-checking to be sure I was not getting them out of order. Meanwhile I kept an eye out for when to launch the second reel. Somehow I had the third reel repaired and mounted with moments to spare. I sat on my stool in the projectionist’s booth and held my breath when my repairs flashed across the screen, the students in the class and even the professor oblivious to the damage I’d done and the repairs I’d made. I think it was the sensation of flying as I sped around the rink that reminded me of those days when I’d sit on my stool watching my first Buster Keaton or Charlie Chaplin through the tiny window in full delight, free to laugh out loud at the antics on screen, and I did, with great joy. But I was passing a knot of people as I thought all this, and I was going too fast, I see that now, because soon I was not making the curve at the far end of the rink as I’d intended but instead caught in some mad death spiral that went faster and faster until I teetered and went down hard, all my weight landing on my slender right wrist. The first few days after the accident when I’d drift off to sleep I’d picture myself making that last fatal loop with a feeling of dread, the inevitable impact startling me awake, jarring my injured arm once again and launching fresh agony. Lately my dreams skip the lead-up to the fall, and instead take me to the instant after I hit the floor, when I first looked down at my sorry wrist, already lumpy and swollen and so very wrong, when all I could do was look back at M, standing on the sidelines, and shake my head hard, No, no. The ambulance. The morphine drip. The all-night stay at the ER. This week I’ll have surgery to set things right. I picture my hand surgeon splicing my fragments back together, a shiver of responsibility running through her as she screws them into place, so that one day I might reach up to lift my boat from its rack and forget for a moment which hand it was that required repair. This entry was posted in St. Paul and tagged falling, rollerblades, St. Paul Minnesota, Wooddale Fun Zone on January 25, 2015 by Jill M.. Your posts seem to have a particular relevance and/or strike a chord with things that are happening in my life. As you know, I recently took a debilitating fall, and seem to have knocked all sorts of things off the shelf as I tumbled down. I feel like I’m still lying amidst the shards trying to accept that they will never quite fit together the way they did. I’m not sure which is harder to recover from, the physical or the social/emotional. It’s probably a wash. But it brings to mind my all-time favorite quote. From Batman. I think the appeal is that it’s so very simple. That’s a great quote. I wish you well in putting the pieces back together. It’s a journey for sure. Thanks for writing. Thanks, Chris! I’ll take a listen. Oh no! The earth will catch you, but not necessarily without injury. Sorry about your spill and the (severe-sounding) damage to your wrist. Hoping your surgery goes well and wishing you a speedy recovery. Thanks, Cindy. It’s my first broken bone, so go figure. I appreciate your good wishes. Ouch!!!!! So sorry you are experiencing this Jill. Healing vibes going out to you. If you are into tinctures, Herb Farm makes a comfrey tincture that helps in healing bones. Co-ops carry that brand usually or you can order online. Thanks, Sarah! I’ll look into it. I had to write something or the injury would get the better of me, and I couldn’t have that. I really like my hand doc already. But that’s okay, my wife says I’m immature too.